In the royal ranks, a baron is pretty low in the pecking order. Yet, for Peel Regional Police’s Project Baron, it looks like they nabbed a kingpin. On March 21, the nearly three-month investigation by the Peel police Vice, Narcotics and Street Level Organized Crime Bureau culminated in six consecutive raids on locations and vehicles across Peel Region and Toronto, all of them linked to one man: 35-year-old Salem Talke of Brampton. What police discovered was one of the largest collections of weapons and drugs seized in the region’s history: Nearly 30 high-power firearms (16 handguns, four shotguns, six rifles), high-capacity magazines, 1,500 rounds of ammunition, a bullet-proof vest, and nearly eight kilograms of assorted drugs, including meth, cocaine, heroin and the deadly fentanyl, commonly found laced into other street drugs and responsible for accidental overdoses across the country. In short, a small arsenal, and $1.2 million worth of narcotics. “This arrest, gun and drug seizure has made a dent in the criminal operations within our community and will significantly disrupt the distribution of illicit drugs and firearms within our region,” said Det. Sgt. Kristine Arnold, the lead investigator on the file, at Tuesday’s press conference. Aside from being one of the region’s most significant busts in terms of size, the inventiveness and creativity of the concealment methods highlight just what police and municipal policy makers are up against when it comes to investigating and disrupting these criminal networks. Hidden compartments in vehicles owned by Talke operated on hydraulics using switches and other mechanisms to access a cache of drugs or guns. 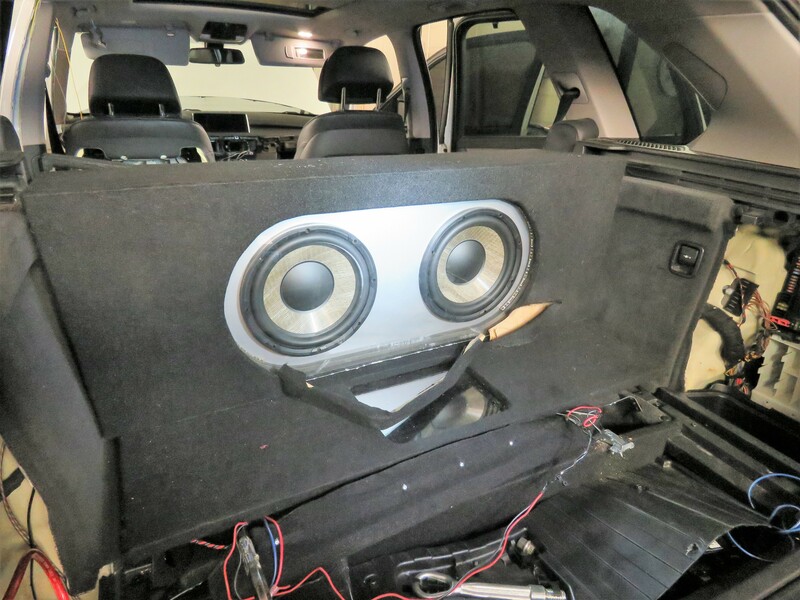 As well, through searches of a pair of residents linked to the offender, one in the Sandalwood Parkway and Hurontario Street area of Brampton and another in Liberty Village in Toronto, police found pieces of furniture with similar hydraulic and magnet-operated compartments. The sophistication, along with the amount of drugs and number of guns, suggests Peel police have captured a fairly big player in the region’s criminal underworld. 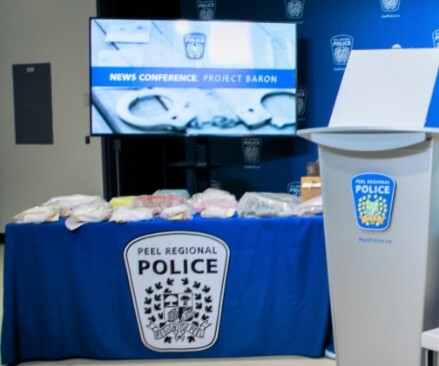 During the press conference, standing before the cache of seized drugs and guns, piled high on adjacent tables, Peel police were able to celebrate the successful investigation for the media. But one thing was also made clear. It’s only the beginning. “We’re far from done our investigation,” Lines said. While Peel police were making the seizure public, down the road in Toronto, Community Safety and Correctional Services Minister Sylvia Jones and Attorney General Caroline Mulroney were making an announcement of their own, releasing details of the second-phase initiatives of Ontario’s Guns and Gangs Strategy. The announcement follows on the $25-million investment made in Toronto last August to help the city combat gun and gang violence. The Ontario government is committing $16.4 million over the next two years to combat illegal gun and gang activity, targeting initiatives that “boost local crime prevention, enforcement and prosecution,” a press release said. The initiatives, making use of what the NDP says is previously announced funding, include a provincial gun and gang support unit to assist in major investigations. The unit will support local police services and prosecutors while conducting regional and inter-jurisdictional investigations. A “Gun and Gang Specialized Investigations Fund” will support joint force operations, though it’s not clear how this funding will be allocated. Several initiatives were also announced to help with proactive intervention initiatives to keep youth away from paths that lead to gangs and violence. “Justice service centres” are being established in downtown Toronto’s east and northwest neighbourhoods, as well as Kenora and London. These centres will “integrate justice facilities with prevention and intervention supports to hold individuals accountable while connecting them with services that prevent crime and break the cycle of offending,” the release continues. "We have listened to communities fighting to curb gun crime and dismantle gangs across Ontario, and new help is on the way," Mulroney said. "Our government is standing up for law-abiding citizens, local police and prosecutors to keep communities safe and protect young people from gang activity." Once again, it’s unclear whether any of this funding will flow directly to Brampton or Peel Region, despite growing worries being expressed by local politicians and residents. During a town-hall meeting hosted by Peel police last fall, many citizens took turns addressing officers with their concerns. A poll of 999 residents commissioned by The Pointer at the end of August 2018 reflected the concerns of respondents about criminal violence in Peel Region. Asked whether they felt Peel police were "doing a good job of keeping Brampton safe," the response was damning. Some 45 percent agreed, while 38 percent disagreed, and 17 percent answered "don't know." Asked, "Overall, do you feel safer than you did four years ago?" only 10 percent of those surveyed said yes, while 26 percent said they felt about as safe as they did four years ago, and 65 percent said no. Still, Brampton continues to wait for word that help is coming from the province. Responding to what would become one of the region’s bloodiest years ever, in 2018, Peel police started deploying extra officers during peak periods. Starting in June, 16 extra officers were deployed on Thursdays and 41 on Friday and Saturdays. Police noted these officers were being used for targeted enforcement to combat drug- and gun-related activity. An additional 55 officer positions have been approved as part of the Peel police budget, at a cost of $8.6 million. The extra officers will bring Peel Region closer to the provincial average for uniformed officers per capita. Peel currently has about 138 officers per 100,000 residents, while the provincial average is 183 and the national average hovers around 188. Former chief Jennifer Evans, who resigned in January, cited rising crime as a reason to bring on more officers. The City of Brampton, though not directly responsible for policing, has been making its own efforts to assure residents that the issue of rising gun and gang violence is being addressed. In an early meeting of council in late 2018, council turned aside a staff recommendation to scrap the Community Safety Advisory Committee and instead revived the committee and expanded its scope. However, the committee has yet to meet. 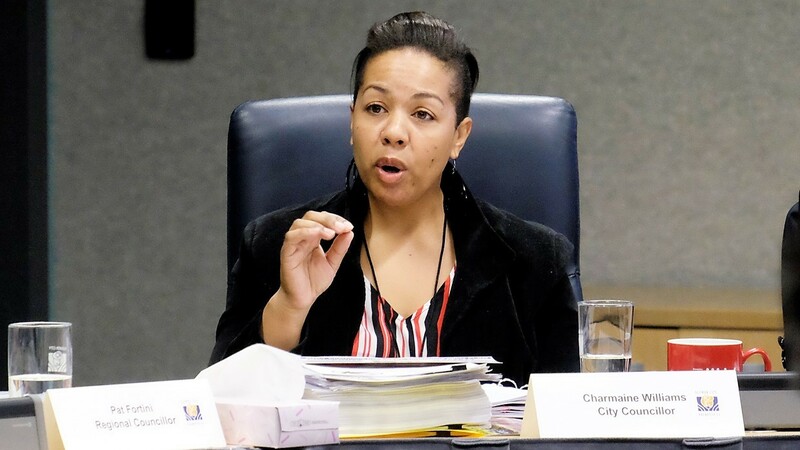 Councillor Charmaine Williams brought up a motion during budget deliberations to provide a financial incentive to residents willing to give up their firearms and ammunition as part of the Peel police gun amnesty program coming in May. A staff report suggests that $5,000 be set aside to offer residents a $100 incentive to hand over unwanted guns. The minuscule budget is based on expected numbers of guns turned in from past amnesty programs, which are carried out in conjunction with Ontario Provincial Police. In 2017, such an initiative netted 69 firearms and 75 pounds of ammunition from 52 homes. In 2018, only 21 homes took part, resulting in 34 firearms and 80 pounds of ammo being turned over. While police readily say that even one less gun on the street is a good thing, compared with the record seizure just completed, another amnesty may not be the most efficient use of funds. But the big question remains, where are the region’s illegal weapons coming from? Data on that is scarce. In Canada, there is no single source of information tracking firearms used in crimes and their origins, whether stolen domestically or smuggled into Canada illegally. Identifying where these guns come from is often extremely difficult, especially when illegal weapons typically have the serial numbers ground off. Where the 26 captured by Peel Police last week came from has yet to be determined. “It’s an extensive process, (but) we have started it; each firearm will have a full background done on it,” Lines said. In November, the federal government took steps to address this very question, pouring millions into provinces and territories to assist in efforts to combat gun violence, as well as providing $86 million to the RCMP and Canada Border Services Agency to step up efforts to stop gun smuggling. In 2017, the CBSA seized 467 firearms, an increase of nearly 19 percent over the previous year. The rise in guns entering Canada correlated with a 7 percent increase in firearms-related offences across the country. The CBSA number gives context to the extent of illegal gun issues Peel Police are dealing with. While CBSA patrols the longest international border in the world, and is responsible for more than 100 land border crossings, its gun seizure numbers for 2017 were only 8.5% higher than the number of guns seized in Peel Region alone in the same year. 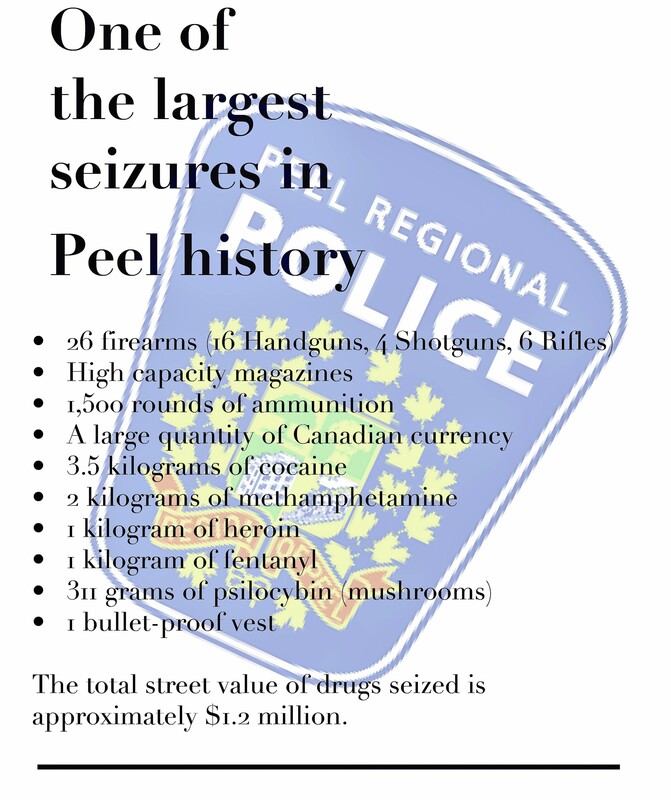 Peel police consistently seize more weapons than their counterparts in surrounding jurisdictions. 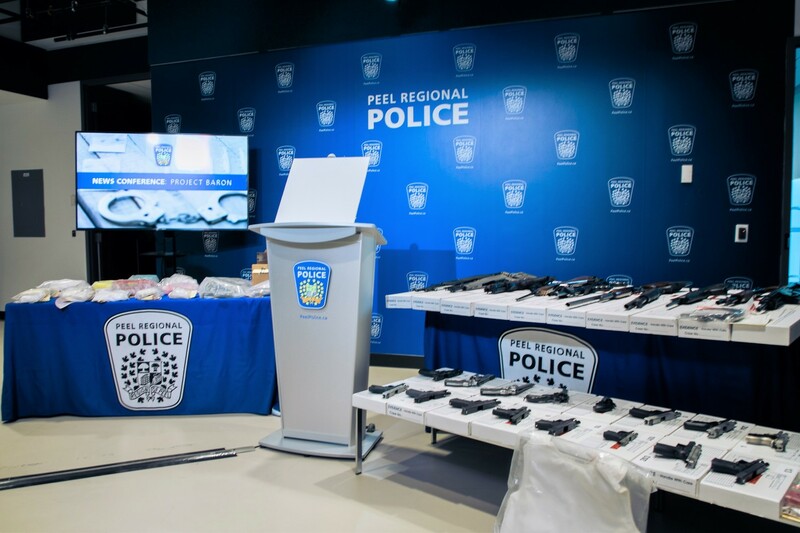 While police forces record data differently, and not all keep a single record of weapons seized, as Peel does, only taking note of those seized during larger operations, a high-level analysis of gun-related charges can give an idea of the gun presence in a particular area. In Peel Region in 2017, the service seized 429 weapons — more than all of York Regional Police’s overall weapons violations, at 413, which can include anything from the intent to use a gun in a harmful way to carrying or using objects such as a knife to do harm. The Niagara Regional Police laid only 82 charges for illegally possessing a weapon in 2017. As well, the OPP-led Provincial Weapons Enforcement Unit (PWEU), a unit made up of representatives from 11 police services, including Peel, seized 154 weapons in 2017, a little more than a third of what Peel police dealt with. 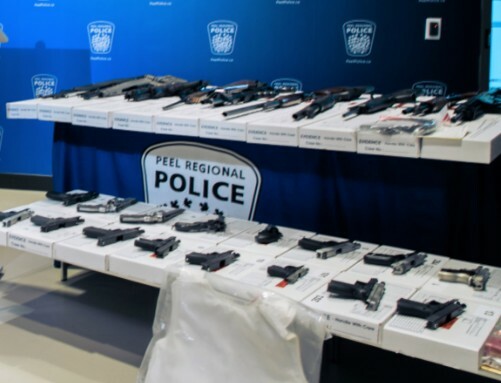 Peel Regional Police also consistently seize more weapons in a given year than the OPP Drug Enforcement Unit (DEU), sometimes more than double the number. In 2014, the DEU seized 410 weapons, while Peel brought in 620; In 2015, the DEU seized 276 weapons, Peel 680; In 2016, the DEU collected 281, Peel 490. Yet, the region continues to be ignored when it comes to receiving larger investments in fighting gun crime. Requests for comment sent to PC MPPs Amarjot Sandhu and Prabmeet Sarkaria as to whether they would be advocating for further funding for these efforts in Brampton did not receive a response ahead of publication. “What they've simply done is re-announce the existing commitment that they had already made,” she said, adding that the funding needs to be directed at programs that engage youth. “What we need is more investment, more hope and opportunity for young people. This government doesn't see that. They're giving with one hand and taking with the other." As for Talke, the man behind the big seizure, Peel police either don’t know or aren’t saying what criminal network or organization they believe he belonged to. “We’re far from done our investigation, as you can imagine with this number of firearms, the followup investigation is enormous and we’re just beginning that phase,” Lines explained. In the meantime, Talke is facing 12 counts of drug trafficking and possession, 48 firearms-related offences, and two counts of possession of property obtained by crime.